If.you’re looking for a game with a fully destructible environment, which you can jump right into and literally have a blast, then Just Cause 3 is right up your alley. Some of my fondest gaming memories have been playing Just Cause and Just Cause 2 on the Xbox 360. So, as a fan of the Just Cause franchise I was overjoyed when Square Enix announced Avalanche Studios was working on Just Cause 3. Similar to previous games, the people are suffering under the brutal control of a dictator, and our man Rico Rodriguez must take out the evil dictator by any means necessary. With an all-out rebellion waging on the ground and in the air, can Just Cause 3 live up to its predecessors and provide an over-the-top action-packed experience? 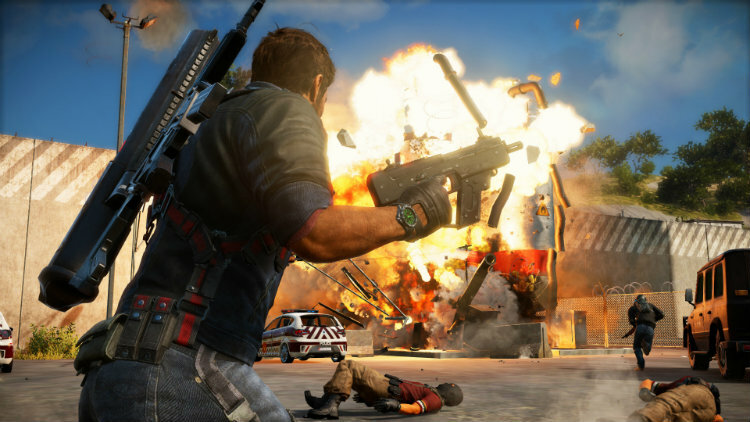 Let’s be honest, the Just Cause series of games have never really had a compelling story line. The main attraction to the games has been the player’s ability to blow up just about everything in plain sight and partake in the mayhem that ensues. 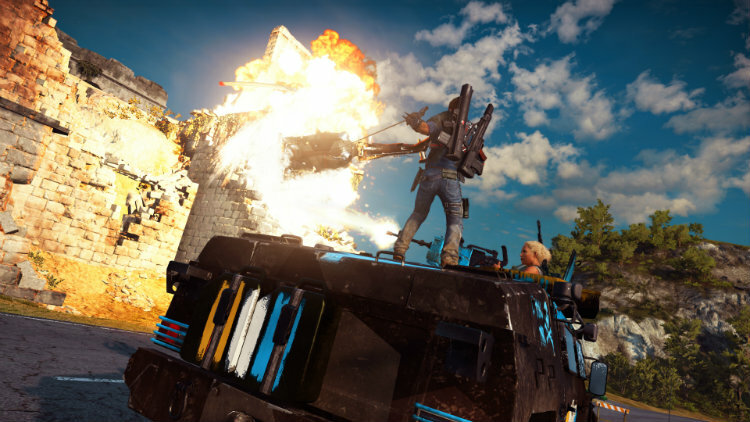 Not much has changed with Just Cause 3, however in the latest open-world extravaganza; the story missions are some of the most entertaining and explosive yet. The action is so intense that it will leave you in awe just watching the environment explode and crumble before your very eyes. One of the most memorable missions I encountered in Just Cause 3 required me to hi-jack a high-tech tank—with what seemed like the entire world trying to kill me. I had helicopters, cars, trucks, and troops on the ground doing everything in their power to take me out. What an exhilarating experience! The world in Just Cause 3 is gigantic! The Mediterranean republic of Medici is over 400 square miles of luscious landscape that has more to see and do than you can shake a stick at. The islands are filled with fishing ports, towns, and military bases that are full of life with an abundance of action always going on. The best part about it is you have complete freedom to pretty much go and do anything you want to do from sky, land and sea. 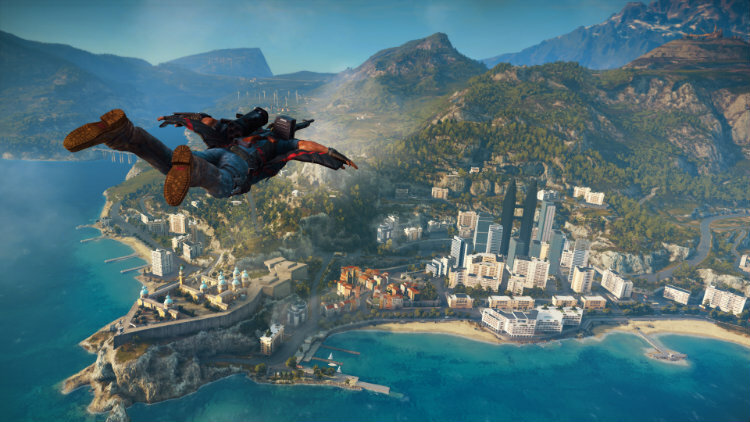 Quite possibly one of the best new features of Just Cause 3 is Rico’s Wingsuit. Consisting of a small set of wings attached under Rico’s arms, it allows you to glide through the air with ease—making it easier to get away from your enemies during heated battle. Combined with Rico’s grappling hook and parachute, you can literally fly forever. I kept challenging myself to see how long I could stay afloat in the air before having to land. You would not believe just how fun this game is! If I had one major complaint about Just Cause 3, it would have to be the lack of multiplayer. Fans have been asking for this feature and even went as far as creating a multiplayer mod for Just Cause 2 themselves on the PC. Although, Avalanche has hinted that there is a possibility of an official multiplayer update or expansion down the road—at his point in time it is still unknown. While loading times have been significantly reduced with the 1.02 patch, they can still can take up to a minute and half to start playing. In retrospect, the patch does offer a massive improvement over the games initial load times of three to four minutes when it first launched. 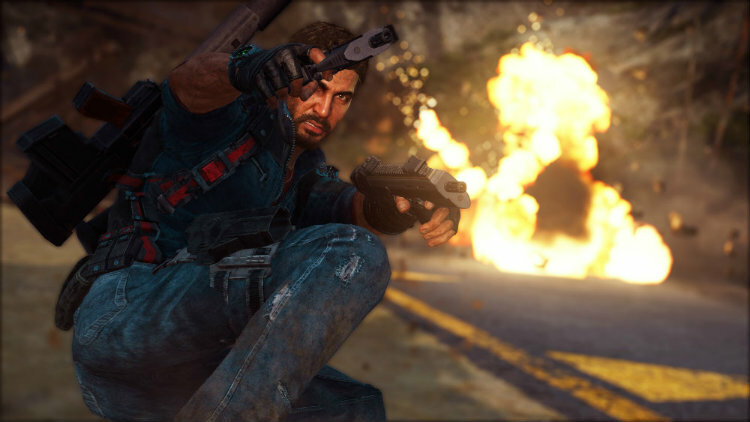 Just Cause 3 is an action-packed game that offers a massive open-world for you to explore. It’s the type of game that you can just pick up and play without the worry of learning complicated controls. Plain and simple, Just Cause 3 is quite possibly the biggest, most explosive, open world game available that will keep you entertained for quite some time.